ACP began in California under the name of Aaberg and Anderson, Inc. in 1993. Jim Aaberg, working alongside Lon Anderson, handled over 10,000 losses in the Northern California region. Because of their reputation for fairness, A & A was named the Special Arbiter for the high profile Class Action lawsuit pertaining to Overhead and Profit in Claim Settlements. In 2003, Aaberg and Anderson proudly opened a second location in Bloomington-Normal, Illinois and eventually became Aaberg Claim Professionals, Inc. ACP is now accepting claims in Illinois, Indiana and Iowa. Gaye Aaberg is the President and Corporate Secretary for ACP. She has over 28 years of insurance and claim adjusting experience. She trained with State Farm Insurance Company as a property and casualty adjuster handling catastrophe claims countrywide, as well as personal and commercial lines. Gaye also spent eleven years managing her own State Farm Insurance Agency before joining ACP. She is dedicated to helping people through the claim process after they have experienced a loss. Jim Aaberg is the companys Claim Manager. He has over 30 years experience with insurance and claim handling. He managed both property and liability operations while a Claim Superintendent at State Farm Fire and Casualty Company. Jim has adjusted and managed virtually every situation imaginable. He is a court certified expert in both policy interpretation and damage determination in multiple jurisdictions. Lon Anderson is a founding partner and now consultant for ACP. His insurance experience comes from many years of managing both an accounting department and claims operation for State Farm Insurance Companies. His background brings a unique level of expertise in investigating, evaluating and resolving very complex insurance issues. Lon is best known for his knowledge of insurance laws and regulations and his tenacity for compliance. Lon is a consultant and is available on a limited basis. 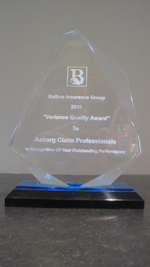 Aaberg Claim Professionals, Inc. continues to provide quality service in 2010. 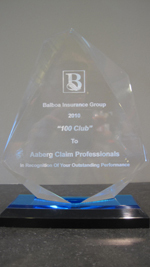 ACP earned top honors from Balboa Insurance Group for being their only independent adjusting firm to have perfect performance scores and becoming a "100 Club" member. ACP was also awarded the "Variance Quality Award" for supplying the most accurate estimates in 2010. 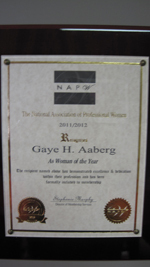 Gaye Aaberg has been recognized by The National Association of Professional Women as Woman of the Year for 2011/2012. Gaye was awarded this title for her demonstrated excellence and dedication to Aaberg Claim Professionals, Inc.